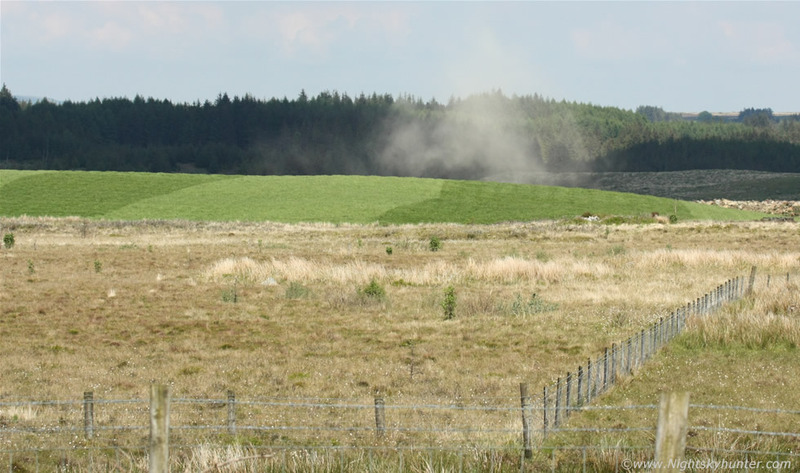 My first ever images of a dust devil, in fact, I observed three of them while shooting a gorse fire between Omagh and Cookstown on June 5th 2013, I was getting distant shots of the fire when I heard my Mum call out ''look at the smoke'', she was pointing behind me into the distance, I turned around and was astonished by the sight, that wasn't smoke, it was a massive dust devil! I had only once seen these before during the warm Summer of 2005 when I first moved into my current estate, one morning I looked out the window and saw two dust devils side by side moving up the road opposite my house, both were the size of a two story house, the sight was amazing and by the time I got my camera they were gone. I have never seen dust devils since, ever, so this was the first time that I have observed them out in the wild, and to be honest I was very excited. I actually saw three of them, by pure chance I caught this first big one on camera with the telephoto, I just had time to aim and take one shot before it vanished on me, but hey I got it on camera!, these two images are crops, the dust bowl was rotating like mad, it reminded me of the US storm chasing videos I had watched showing a tornado forming on the ground kicking up dust in a rotating bowl before the condensation funnel filled in from above, that's exactly how this looked, rotating like crazy and moving across the ground from R to L, it was incredibly exciting to watch and I felt quite blown away by the experience. Dust devils are extremely rare in this country, you need a dusty environment and dry hot weather with the correct synoptic conditions to catch them and to be there at the correct place at the correct time is very hard to do, and here I saw three of them, read the report for more information. * All images are available for sale in the form of photo prints, canvas or digital files for licensing, if you are interested in a purchase simply drop me an email.